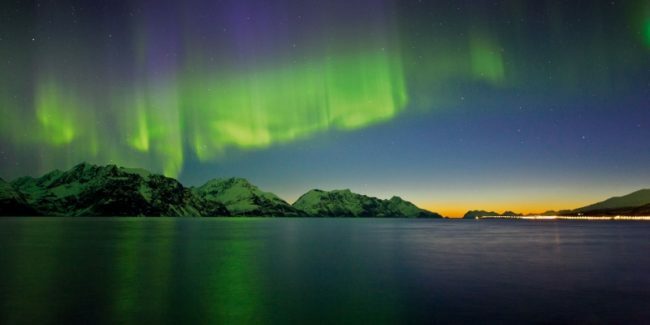 Norwegian Northern Lights Voyage – The Great Canadian Travel Co.
Join us at the height of Norway’s northern lights season and learn about the cosmos from an onboard astronomy expert who shares his in-depth knowledge and passion for the Arctic sky. 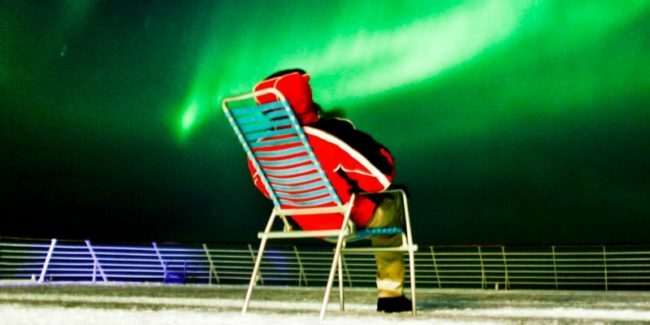 Hear special on-board lectures and join exciting excursions to see the northern lights with your own eyes! 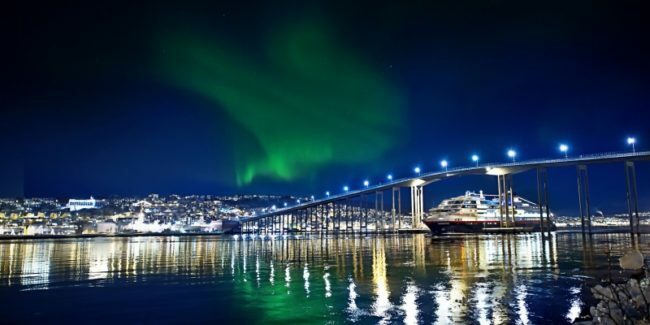 Also available as a 6 day/5 night cruise from Bergen to Tromso or Tromso to Bergen, perfect if you’re short of time or want to combine a Norwegian Northern Lights cruise with a land program or trip to another destination. Please ask us for details of the shorter itinerary and prices. Starting prices are shown in US$, per person, based on two people sharing a twin cabin. Single use of cabin, triple share and quad share rates are also available. The rates shown are for sailings on the Trollfjord or Finnmarken on specified Aurora cruise dates. Prices on these ships vary by date of travel and cabin type. The cabin types also differ slightly on each of the ships. As availability and prices change frequently and without prior notice please inquire for current availability and cabin pricing. Your expedition starts in Bergen, a city surrounded by seven mountains. Before departure you may wish to explore this cultural gateway to the fjords. A pre-cruise city package can be incorporated in your vacation program. Sail north from Bergen along the Hjeltefjord, the same route the Vikings once sailed to the Shetland Islands and beyond, heading to the high north. Spend the rest of the evening relaxing as you take in the spectacular landscapes passing by. If you wake up early today, you have the chance to enjoy the breathtaking beauty of the Nordfjord. As you sail past the West Cape, you experience a rare venture into open sea. Then the ship navigates through skerries and islands before reaching Ålesund. An early arrival at this Art Nouveau town gives you an opportunity to go ashore and explore. Today you wake up in beautiful Trondheim. The architecture and surroundings in Trondheim create a beautiful and almost mythical setting for any outing, whether you prefer a guided tour of the Nidaros Cathedral or a casual walk through the Bakkland district. In autumn you can join the trip out to Munkholmen. Originally an ancient place of execution, it became a Benedictine monastery around the year 1000. In 1658 it was made into a fortress and prison, and later a customs station. In the afternoon the ship sets a northwesterly course, passing the beautiful Kjeungskjær lighthouse and numerous charming islets and rocky outcrops. In autumn you can learn more about navigation and lighthouses along the Noryougian coast during the Captain’s talk. After passing through the narrow Stoksund, the ship arrives at charming Rørvik. The Arctic Circle marks the entry into the Arctic region. During autumn and winter, being above this degree of latitude gives you the best chances of experiencing the Northern Lights. You continue sailing along the beautiful coast of Helgeland up to Bodø. Later this afternoon the sight of the 1,000m high Lofoten Wall will appear on the horizon. The charms of the Lofoten Islands are revealed in all the small, picturesque fishing villages with their bohemian atmosphere. 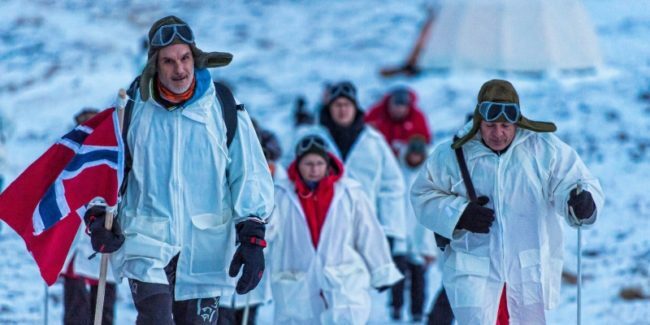 In winter, crossing the Arctic Circle is when the hunt for the Arctic light begins. You celebrate this with a presentation of ‘The Magic Light, Aurora Borealis’, where you can experience this phenomenon via pictures, words and music. After sailing through the narrow Raftsund, you stop at the entrance to Trollfjord. Here you are served freshly made fish cakes out on deck. You will also hear the story of ‘The battle of Trollfjord’, which took place here in the winter of 1890. The ship continues to Tromsø for a prolonged stay. In winter you can complete our stay in Tromsø with a thrilling husky dog sled ride. After an exhilarating day in Tromsø, you continue our northbound journey. In winter the Captain invites guests to taste stockfish on deck. 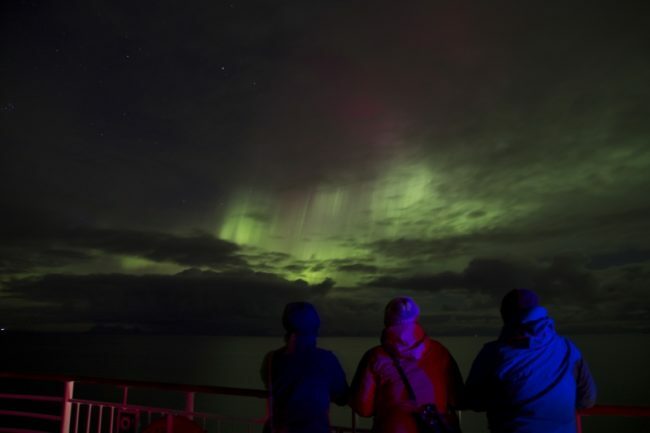 The ship is now sailing into the area along the coast where you have the best chance of seeing the Northern Lights between September and March, and you gather on deck to search for this breathtaking phenomenon. Enjoy the magnificent sub-Arctic landscape as you cross the 71st parallel on your journey towards the North Cape, the northernmost point on the continent. After brief early stops in Hammerfest and Havøysund you arrive in Honningsvåg, the gateway to the spectacular North Cape. Close to the North Cape you find one of the world’s most exciting nature reserves, Gjesværstappan. Your ship continues north, sailing in the heartland of the indigenous Sámi people. You pass their ancient sacred site, the rock formation Finnkirka. As you approach your next stop, the fishing village Kjøllefjord, local fishermen every so often visit the ship during winter and spring to share their catch of the day out on deck, usually King Crab and Cod. 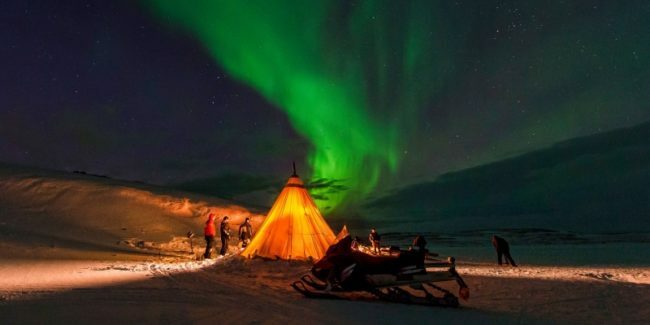 Here you have the opportunity to learn more about the Sámi people, as you explore the wonderful scenery. 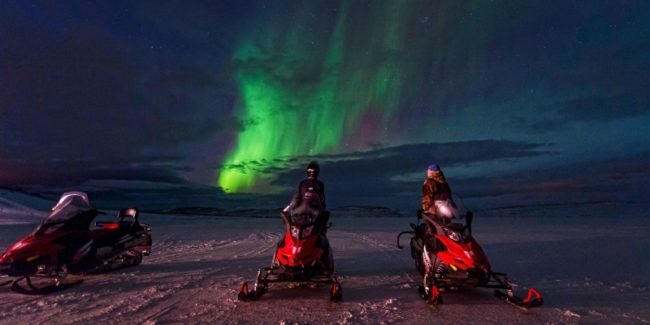 In winter you can join an unforgettable snowmobile trip to one of Europe’s most extreme and exciting natural areas. After breakfast you arrive in Kirkenes, at 30° East, further east than Istanbul and St. Petersburg. The Russian border is close by, and you may find it intriguing that the road signs are written in both Norwegian and Russian. You can choose to explore the Arctic winter on a snowmobile, driving over a frozen fjord. Or take a husky dogsled adventure – the huskies eagerly transport you across the frozen landscape, taking you through the arctic wilderness. You can also visit the Snow Hotel and meet the reindeers living in the grounds. As the ship starts its voyage south, you can first enjoy a wonderful lunch followed by views of Arctic wilderness. There will be a presentation on Pomor trade history en route today. The ports previously visited by night on the northbound journey are now seen by day. In the afternoon the ship docks in Vardø again, Norway’s easternmost port. Weather permitting, you may be invited to experience ice bathing in the Arctic Ocean. On board there will also be a presentation by local Arctic divers who will bring displays and give a lecture out on deck about life in the ocean. You continue along the Varanger peninsula to Båtsfjord before reaching Berlevåg in the evening. In the middle of the night you dock at Mehamn, where you can join an unforgettable snowmobile trip through one of Europe’s most extreme and exciting natural areas in winter. 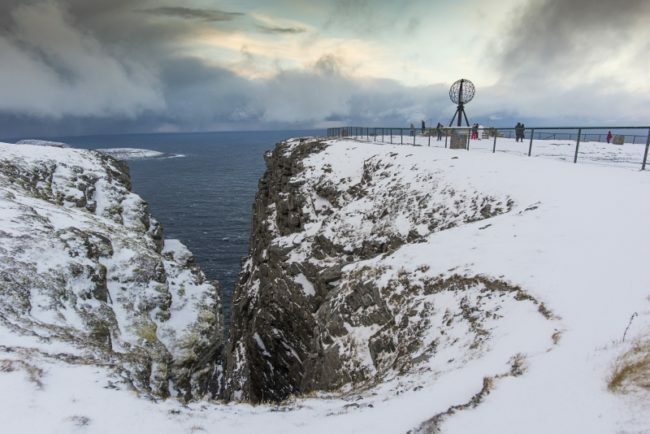 In Honningsvåg you can enjoy an excursion and breakfast at the North Cape while discovering hidden parts of Finnmark. 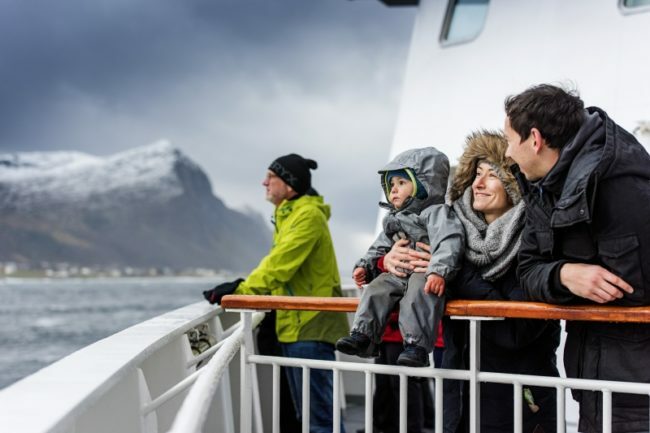 Before stopping in Hammerfest, you can enjoy an ‘energy coffee’ and a short introduction on board to ‘Melkøya, the northernmost natural gas terminal. In autumn you may have the change to taste dried reindeer meat on deck. 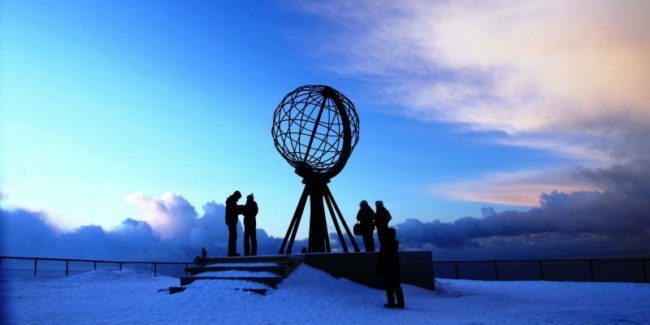 In Hammerfest you can join a city guiding and see the UNESCO-listed Meridian Column, erected in 1854 to commemorate the first precise measurement of the globe. You continue south to Øksfjord. The ship’s crew will run a seminar on how to tie various maritime knots. After crossing open water, you will make a brief stop at the old trading post of Skjervøy. You dock in Tromsø – “the gateway to the Arctic” – just in time to enjoy a midnight concert at the Arctic Cathedral. Alternatively, a walk around town will give you the chance to enjoy a local brew in one of Tromsø’s many friendly pubs. Passing through the legendary Lofoten Islands the ship negotiates an intricate network of inlets and isles. This is one of the most beautiful stretches of the Norwegian coast for many it is the most stunning part of your journey south. Crossing the Arctic Circle at 66°33’N is an important ‘rite of passage’ today. You celebrate this with a taste of our Arctic traditions out on deck. Another highlight is sailing past the Seven Sisters mountain range. All seven mountains are between 900 and 1,100 metres high, and it is easy to understand why these ‘ladies’ have inspired ancient myths. You take a short stop in Nesna, an idyllic old trading post before moving on to Sandnessjøen. In Brønnøysund you may take an excursion to the Noryougian Aquaculture Centre. Today gives you another opportunity to explore the city of Trondheim. The city walk is a journey through its 1,000-year history. Back on board, the ship heads out of the majestic Trondheimsfjord, 170km long and up to 25km wide. Like all other Norywegian fjords it is deep, reaching 577m at the deepest. As you sail along the coast you’ll realise the importance of fish to Norwegian coastal communities. Kristiansund’s location has formed the basis for a wealth of opportunities in the fishing, shipbuilding and oil industries. The town reigns as Norway’s ‘cured cod capital’ because of its long time export of salted dry fish. Here you can join a trip to the Atlantic Road, one of Norway’s most visited tourist destinations. 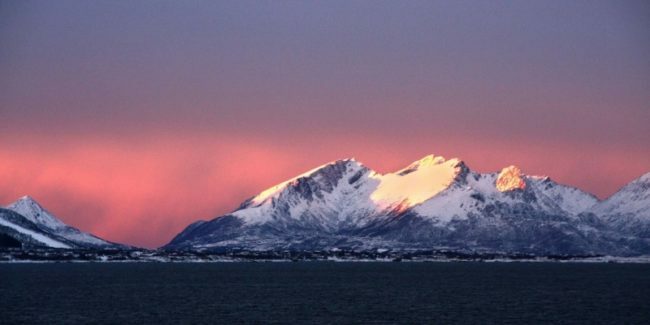 As you cross the open sea to Molde, known as the ‘city of roses’, you will notice the steep, grey, pointed peaks of the Romsdal Alps. During the night, the ship will call at Ålesund, Torvik and Måløy as the world’s most beautiful voyage starts to draw to a close. But before you dock in Bergen there are still a few nautical miles of fascinating scenery ahead, such as the picturesque Nordfjord below the enormous Jostedal glacier. You will make a call at Florø, a modern town representing the Sogn og Fjordane region’s oldest and Norway’s most western town. A few nautical miles south of Florø you navigate the estuary of the mighty Sognefjord. You also get the best views of the archipelago en route before you finally disembark in Bergen. One-way voyages Northbound and Southbound combined with a one-way airfare are also available – ask us for details. This Norwegian coastal voyage with Hurtigruten takes you from Bergen to Kirkenes and back, through almost 1,500 miles of some of the most spectacular scenery on Earth, showing you the beauty of the Norwegian coast. 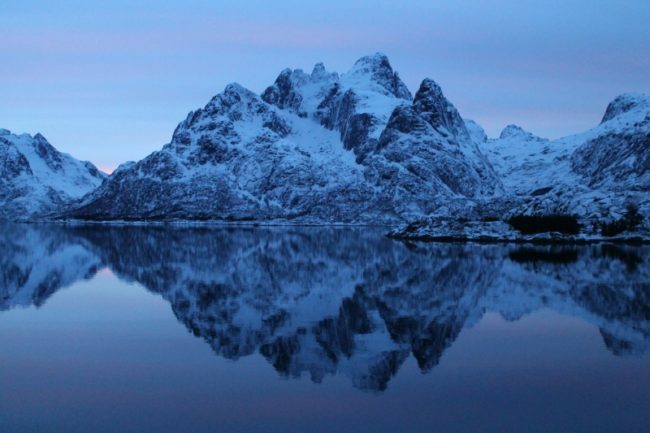 Discover Norway’s entire coastal route with 34 ports, named by Lonely Planet as the world’s most beautiful voyage. The voyage includes a Polar Circle crossing and special celebration and offers many optional excursions to enhance your experience. There is a reason famous travel routes are ‘famous.’ Each offers epic landscapes and the distinctive ability to transport the traveller through time and turn fleeting moments into life-long memories. 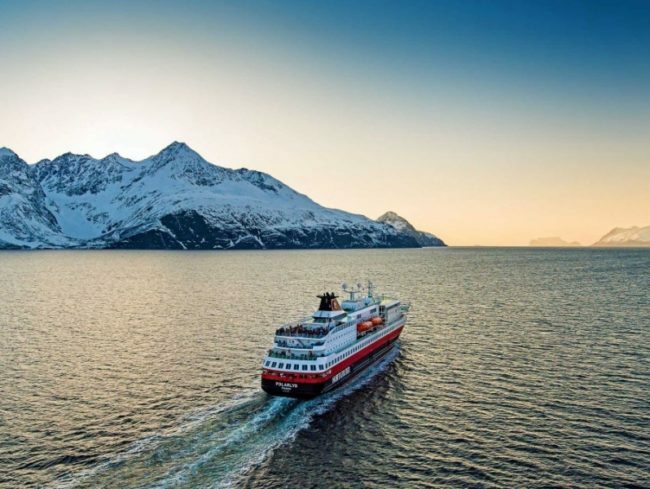 The Hurtigruten Route along Norway’s coastline rightly earns its place in the hall of fame of iconic traveller routes along with other classics like the Orient Express, Europe’s Danube, and the revered Route 66. On this trip you get nothing but spectacular experiences. Visit cities like Bergen, Ålesund and Trondheim, before crossing the Polar Circle and sailing into Tromsø. Southbound you get to see Lofoten and Trollfjorden in broad daylight, before sailing along the Helgeland coast, passing the Seven Sisters mountains. Let yourself admire the overwhelmingly beautiful west coast on the way to the final destination, Bergen. Norway Early Booking Savings: Book your 2018/19 coastal cruise early to get the best cabins and prices. Terms and Conditions: Valid for new individual bookings on select departures as detailed above. Offer expires on December 31, 2017, but Hurtigruten has the right to limit, change, or discontinue this offer at any time without notice. 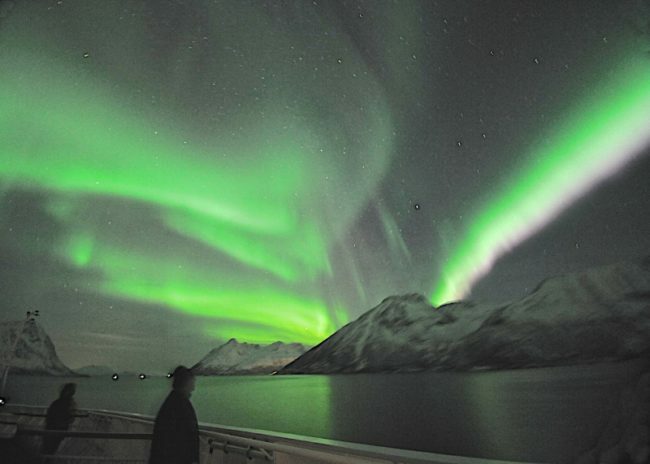 Northern Lights Guarantee: We’re so confident that the northern lights will make an appearance during your 12-day round-trip cruise in Norway that if they don’t, we’ll give you a 6- or 7-day cruise free of charge*. A Northern Lights Occurrence is defined as a sighting from the ship which is recorded by the ship’s deck officers and which is announced to passengers on board. An occurrence can last anywhere from a few minutes to a matter of hours, and the ship’s decision as to whether the Northern Lights occurred is final. 2017/2018 Season Cruises: Valid on new bookings only, on 12-day roundtrip cruises with sailing dates starting October 1, 2017, and cruises completed by March 31, 2018. 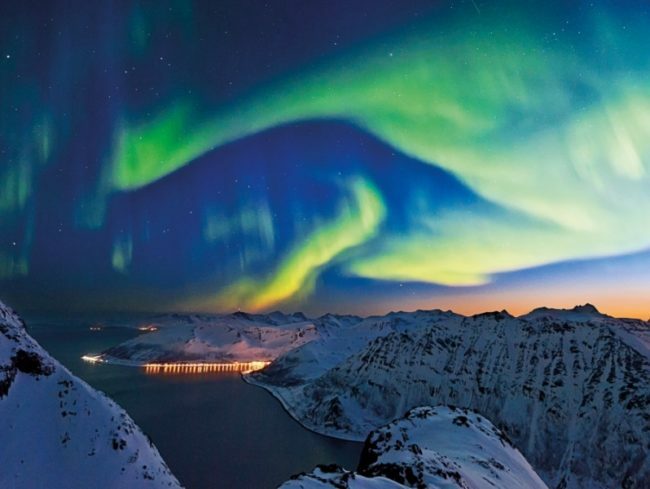 If there is no northern lights occurrence during your cruise, a 6- or 7-day cruise will be offered to you departing between October 1, 2018, and March 31, 2019, in an unspecified cabin on a full-board basis. Airfare/extras are not included. 2018/2019 Season Cruises: Valid on new bookings only, on 12-day roundtrip cruises with sailing dates starting October 1, 2018, and cruises completed by March 31, 2019. 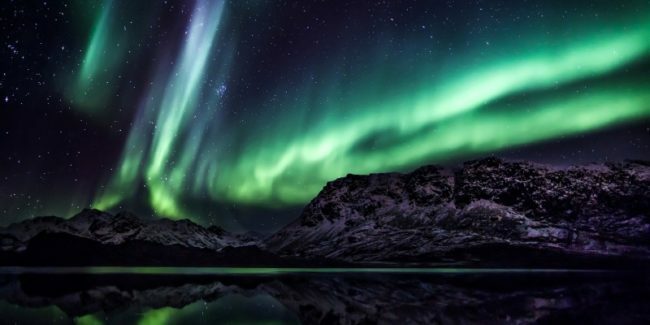 If there is no northern lights occurrence during your cruise, a 6- or 7-day cruise will be offered to you departing between October 1, 2019, and March 31, 2020, in unspecified cabin on a full-board basis. Airfare/extras are not included. Extend your trip: Add on some time in Oslo or Bergen before or after your cruise or take a train ride through the stunning interior of Norway. Maybe you want to fly on to another destination in Europe or beyond? No matter where you want to travel to next, we can assist with your plans!